This past weekend I stopped into our local bike store, Bicycle Planet, which was displaying big signs in their windows that said "Clearance Sale." But I wasn't looking for bike gear. This store carries performance apparel from makers like Sugoui, Pearl Izumi and Craft along with other quality brands that specialize in cycling. I was hoping to find a bargain on long sleeved tech shirts that I could use on cold morning runs but even with the sale the clothes were pricey. There were some heavier jerseys with zip fronts that were well priced. Since cyclists ride 3-4X faster than I run they clearly need the wind protection. These jerseys were nice but they didn't meet any current needs so I ended up leaving empty handed. I'll be back soon with my Trek bike which needs a serious tuneup. The next day we paid a visit to the outlet stores and I did my usual rounds at Adidas (poor selection of running clothes, no bargains on running shoes) and Nike. Nike had little running apparel on display and, for what they had, the prices weren't compelling. I don't care for Nike shoes but I was curious to try a pair of Zoom Equalon 3's that were on special for $80.00. I didn't like the fit and I guess I'm a little biased since my last experience running with Nike shoes was fairly negative. I stopped in at Reebok because it was there (did you know Adidas owns Reebok?) 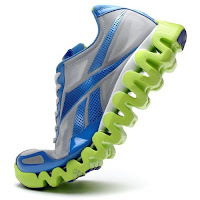 and, again out of curiosity, tried on a pair of their top of the line stability shoes. Every time I try on Reeboks I understand why no one I know runs in them. The shoes I tried on Sunday felt clumsy, with an awkward transition from heel to toe. As I was leaving I noticed a display for the new ZigTech shoes. They only had smaller sizes to try but I looked at the display models and wondered what the fuss was about. The shoe is bizarre to begin with - a weirdly shaped boot with a strange wavey-springy out sole that doesn't seem fully attached to the shoe. In pictures the shoe looks interesting. In real life it looks like something you'd find on a Polly Pocket doll. I left the outlet stores without a single purchase but with a renewed respect for the gear and for shoes from the real players like Brooks, ASICS and Mizuno. I had to chuckle when your said, "Polly Pocket" running shoes... so true.